HUGE THANKS to everyone who turned out in full force this past weekend! 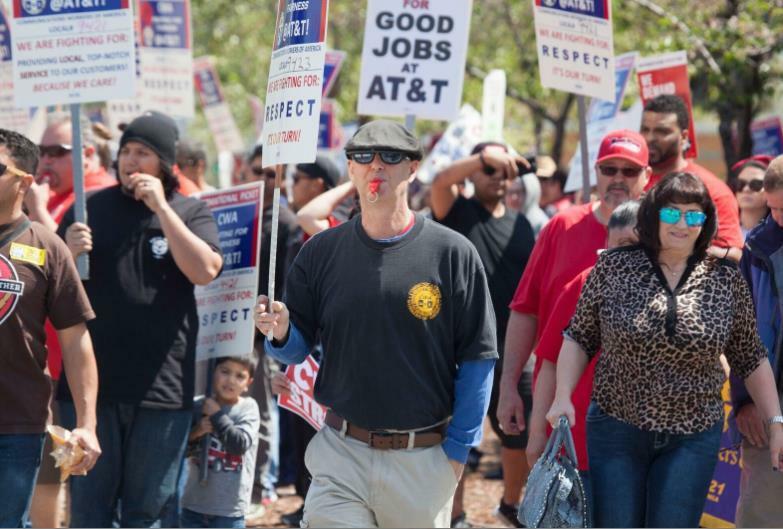 For the one year anniversary of our contract expiration with the company, over 700 of us marched in San Jose to protest AT&T’s corporate greed. Our rally and our recent successful one-day strike is proof that we’re ready to do whatever it takes to secure a fair contract. AT&T now knows that tens of thousands of their employees may walk off the job at any moment unless they get their act together. Even though we have had to wait over a year, momentum is on our side. People around the country are watching for our next move and our elected officials are vocally backing us. “It’s time to stop the corporate games and start bargaining fairly with the workers who work hard every day to ensure its operations are running smoothly and effectively for all the communities it serves,” said District 9 Vice President Tom Runnion. What’s next? We’re going to forcefully take our case directly to the company’s owners. Our next major action against the company will be during their annual shareholders meeting at the end of April. We’ll have more details on the shareholders meeting and other ways you can help in the coming days. the District 9 website. (www.cwad9.org), Local Websites and email lists.